The Curious Wavefunction: Book review: Andrew Roberts's "The Storm of War"
The contemporary World War II historian faces a monumental task. He must sort through the enormous literature on the most devastating conflict in human history, both known and recently unearthed, and then pick out the gems. He must then string these gems together into a coherent narrative that strikes the right balance between offering all important details and yet not miring the reader in a dense thicket of minutiae. The achievement of this objective is the mark of a true historian, and in his new, stunningly succinct and yet comprehensive history of World War II, Andrew Roberts more than accomplishes this objective and reveals himself as a historian of the first rank; in the words of The Economist, "Britain's finest military historian". What distinguishes Roberts's book from other World War II histories is that it's simply the most stunning encapsulation of every single front in the conflict in a relatively slim 600 pages that I have read. In his drive to leave no stone unturned and his capacity to compose brief portraits of key people and events, Roberts surpasses even eminent historian John Keegan. Roberts's style is distinguished by terse, tightly knit chapters that deliver the goods in brief paragraphs and analyses. While generally chronological and covering each important front, the chapters also include separate ones on the Holocaust and on strategic bombing. A single, absolutely masterful chapter summarizes the conflict at the end. Bringing new information to bear on well-known events, Roberts provides striking new insights into the war and puts some long-harbored beliefs to rest. The most important thread running through Robert's retelling of The War constitutes the singular mistakes that Adolf Hitler made and his underlying motivations while also highlighting his strengths. Hitler had an unusually prodigious knowledge of military equipment and detail and was a shrewd controller of men; a striking example was when, in the aftermath of his victory over France, he suddenly promoted twelve generals to Field Marshals, thus generally diluting the distinguished character of the rank and emphasizing his dominion over his officers. However, whatever his strengths were were far overshadowed by the stupendous mistakes he made. Admittedly the greatest was to decide to attack the Soviet Union. Hitler completely underestimated the sheer tenacity of the ordinary Russian soldier and citizen and, on the other side of the continent, also underestimated the tenacity of that tiny island named England. His second great mistake was to foolishly declare war on the United States. Here Hitler made an even more elementary error in underestimating the enormous resources and production capacity of the United States which soon started bolstering the great Soviet war machine as well as the British. Most importantly, Hitler committed both mistakes fueled by his essential Nazism and thirst for Lebensraum (living space) in the East. And the fundamental underlying ideology driving this thinking which finally drove a stake into his grand plans was his racial theory about inferior Slavs and Jews. It was this rabid racial ideology for instance which prevented him from shrewdly taking advantage of Eastern Russians' contempt for Stalin's regime and turning them into allies; instead Hitler assigned the feared Einsatzgruppen to essentially wipe out Russian towns from the map. These SS units participated in the wholesale personalized murder of a million Russians in 1941 alone, killing on a scale whose sheer personal nature and horrifying brutality dwarfs even the later industrialized gassings of The Holocaust. Roberts does a superb job of highlighting how it was this basic racial and xenophobic mentality that drove almost all of Hitler's mistakes including most of his military ones. Roberts also has revealing analyses of more tactical errors by Hitler. These include not ramping up U-boat production in time to possibly starve Britain and make her sue for peace, not focusing on fighter development without which his cherished bombers would be useless, and being almost blissfully indifferent to the Japanese whose help he could have considered in invading the Soviet Union. And then there were of course his two cardinal tactical errors; letting the British get away at Dunkirk (Roberts demolishes the belief that Hitler did this because he was interested in peace negotiations with Britain) and even more importantly, halting the advance on Moscow in the summer of 1941 and suddenly driving his forces to the South. This miscalculation, combined with Stalingrad and the later great tank battle of Kursk, signaled the death knell for the Nazi regime. 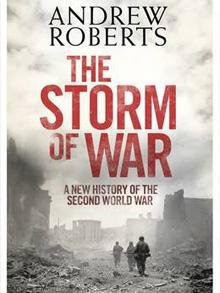 Roberts also pays due attention to the Pacific theater of war including the incredibly bloody fighting at Guadalcanal, Iwo Jima and Okinawa (although readers wanting a more complete treatment should check out Max Hastings's excellent "Retribution: The Battle for Japan, 1944-1945"). His discussion of this front includes a superb chapter on the Battle of Midway which was the turning point in the Pacific war, and most notably a detailed and riveting analysis of the more under-appreciated stage of the battle in Burma. The British response in Burma against a determined enemy in a sweltering thicket of tropical heat and rain forests was comparable to anything else in the War, and Roberts calls the defeat of the Japanese in Burma the "greatest gift that the British could have given India". He also has detailed and tactically accomplished accounts of the war in North Africa, (against Rommel's famed Afrika Corps), Normandy, Sicily and Italy and of the Ardennes offensive (The Battle of the Bulge) and the march towards Berlin. These accounts are interspersed with sharp portraits of men like FDR, Churchill, Eisenhower, Montgomery, Manstein, Rommel, Keitel and Goring. Robert's chapter on the U-boat war is particularly skilled and he carefully documents the initial disasters that befell the British navy in the Atlantic. The U-boats sank millions of tons of shipping, and if Hitler had stepped up production earlier he could have starved off Britain much sooner in the war. However, in the end it was not the resilience of the Royal Navy nor Germany's increasingly dwindling war production capability that were decisive; it was a secret weapon that was developed by mathematician Alan Turing and his colleagues at Bletchley Park near London. It is difficult to overemphasize the absolutely crucial role that breaking the Enigma code of the Nazis played in the war. It is a silent undercurrent running through Roberts's narrative but its overwhelming importance is clear; it was code-breaking that won the critical Battle of Midway, and it was code-breaking that proved pivotal not just in the U-boat battle but in North Africa and in Normandy. It was not the atomic bomb, not even radar, but the obscure code-breaking work of brilliant scientists toiling away in the utmost secrecy that really won the war. Further on Roberts has separate chapters on the Holocaust and on strategic bombing. His chapter on the Holocaust is painful to read and captures the key facts, including why FDR avoided bombing the train tracks to Auschwitz; there was genuine concern about killing prisoners (concern that in hindsight seems misguided) and such bombing was seen as a diversion of bombers from German cities. Roberts's analysis of strategic bombing is highly readable. Along with the atomic bombing of Japan, it's strategic bombing that is the most controversial part of the Allied campaign. The destruction of Hamburg and Dresden are well known (the latter made famous by Kurt Vonnegut's "Slaughterhouse Five"). Roberts wisely avoids passing any moral judgement and simply analyzes whether the carpet bombing of German cities worked, and whether it was necessary. The answer to the first question is decidedly yes. There is a clear correlation between dwindling German war production and air power and the Allied bombing campaign; the bombing also kept German aircraft away from the Eastern front. The answer to the second question is more ambiguous, but in hindsight provided by the first answer it too appears favourable. Certainly the number of people killed in German cities by bombing, while quite high, was dwarfed by ground losses on both Western and Eastern fronts. If I have a minor gripe with the book, it is that Roberts could have added about a hundred more pages and fleshed out the chapters on Stalingrad and the Holocaust in more detail. No matter how many books you read about the War, the Eastern Front and the Holocaust comprise a set of events which constantly beggar belief by their sheer magnitudes and leave one's mind shatteringly numbed. While 6 million Jews and others were murdered in an orgiastic frenzy of factory-like slaughter, 27 million Russians lost their lives in what can only be described as Dante's worst nightmare, a sea of blood whose volume is unmatched in human history. Just one statistic puts the staggering Russian losses in perspective; for every American soldier who died on the battlefield, 60 Russian soldiers lost their lives. About a million men died at Stalingrad alone compared to half a million or so American soldiers in the entire War. At the same time, the unimaginable ferocity on the Eastern Front was possibly matched only by Josef Stalin's own monstrous barbarity toward his own people; not even Hitler personally tortured and murdered hundreds of thousands of his own officers and generals for absolutely no reason. In the annals of twentieth century brutality nobody can match the excesses of Stalin, and these excesses manifested themselves dangerously in the complete lack of preparation the Soviet Union faced during the early Nazi onslaught. It was only the gargantuan resolve of ordinary Russian citizens and soldiers combined with the certain death at the hands of their own officers that deserters would face (thanks to Stalin) that forced every Russian to fight for his or her life. The Nazi-Soviet conflict can only be seen through the lens of one of those mythical conflicts signaling the end of the world. While tomes have been published both on this conflict as well as the singular horror that was the Holocaust, Roberts has relatively brief (although highly well-informed) chapters on both topics and I thought that an addition of a hundred or so pages would have been a small sacrifice for some added narrative on these earth-shattering events. But these are minor issues. In the purview of his analyses, the crisp and riveting style of his narrative and the comprehensive detailing of every single important front, battle and fact of this great conflict, Roberts is second to none. While Roberts's basic thrust is to highlight Hitler's tactical mistakes, his overweening racial ideology and his conflict with his generals, in retrospect of course such analysis is relatively easily enunciated. Just think of how we would have written history differently had the Nazis, God forbid, won the war. We would possibly be talking about French casualties incurred by Allied bombing instead of British casualties in the Blitz (the former actually exceeded the latter), and General Mark Clark letting the Nazi tenth army get away in Italy instead of Hitler letting the British get away at Dunkirk. Given the capacity of Hitler's armies, the experience and fighting capability of the German solider (probably the most well trained of any in the conflict), the superiority of German weaponry and the brilliance of his generals (of whom some like Manstein, Rommel and Guderin were regarded as the finest strategic minds on any side), it was by no means obvious that the Nazis would lose. But as Roberts's overall message in the book overwhelmingly indicates, in the end Adolf Hitler lost the war because of the same reason that he almost won it; because he was a Nazi. I highly recommend this sweeping historical narrative. The Second World War was a transformative event in human history that should be remembered until the end of time. It deserves the constant and passionate attention of the finest historians of their generations, and Andrew Roberts proves himself as one of the best of this class. What more can ine add to this marvellous summary? Maybe to point out that Andrew Roberts himself singles out not Manstein, Rommel or Guderian but Georgi Zhukov as the greatest general of the War, his being the victor of the battles of Moscow, Stalingrad, Kursk and Berlin.